An unusual judo tournament was held in the Russian capital on Saturday, where members of the police, fire brigade, and the army took to the tatami mats to wrestle for the armed force's European crown. 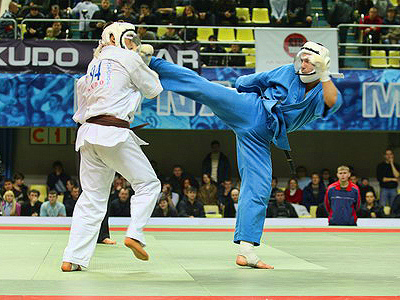 The inaugural Open Team judo tournament was held in Moscow in 2007, and last year it became the European championships. The annual number of participants is increasing, and this year, policemen from 16 countries flocked to the capital to wrestle on the tatami of the Dynamo arena. Judo plays a very important role in the training of army and police personnel. But beside that, the goals of the event are to encourage co-operation between police from different countries, and to promote judo as a sport. But it's also dedicated to the memory of their colleagues who have died in the line of duty. “It's a very significant tournament for us in many ways. We commemorate all the policemen who have died on duty. And it's important in terms of bringing up young judo followers. That's why I think there should be more events like this. And I hope we're moving in the right direction, and we'll continue to hold this tournament,” said the President of European Judo Union, Sergey Soloveychik. And the policemen, who run into risk every day at work, devote themselves to judo with true passion. The home crowd enjoyed the dominance of the Russian police, who finished first and second. “I'm satisfied with the result. We have a good team, we've been competing together for several years, and tonight we produced a solid performance – that's why we're on top,” explains participant Mikhail Starkov. The tournament may appear non-competitive, as the participants are technically amateurs but the tension in every bout is very high. It’s very appealing to the spectators, who'll probably ensure the Dynamo arena will be packed again next year.